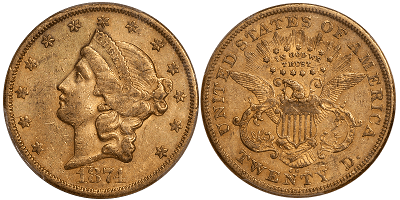 There may be no 19th century United States gold coin more popular than the Carson City (CC) Liberty Head Double Eagle. Struck using metal from the nearby Nevada gold mines, these coins have come to symbolize the Wild West era more than any other rare coin, and they have an appeal that resonates with collectors and investors around the world. 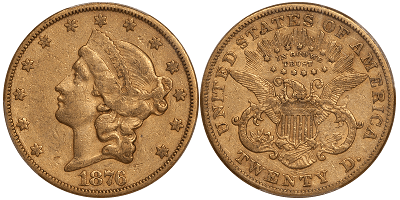 Carson City Double Eagles were struck from 1870 through 1893. After the California Gold Rush led to the San Francisco Mint, the famous discovery of the Comstock Lode precipitated the creation of a branch mint in Carson City. Collectors focus on Carson City Double Eagles in a manner of ways. Some collect one of each date in as high a grade as possible, while others collect by type. Because the 1870-CC Double Eagle is the only exceptionally rare date in the series, of which only 40 to 50 are available, many collectors often don’t include this date. Instead, collectors will often focus on other dates in higher grades, which are rare in and of themselves. Collectors and investors alike are drawn to CC Double Eagles, as it’s extremely difficult to complete the entire series. It’s estimated that only around four dozen complete collections are available. It is a little-known fact that many CC Double Eagles wound up in European banks—where they quietly sat for decades. Our numismatic consultant Doug Winter hand-picked a small group of CC Double Eagles from one of his European sources, and he selected coins which are notable for their eye appeal and their “dirty” original appearance. For those of you who are interested in securing any of these coins before they disappear from the spotlight again, please call us at 800-831-0007 as soon as possible. This selection of CC Double Eagles is a fantastic complement to other rare coins. If you’re interested in exploring similar rare finds, we can help you bring your portfolio together. This is a Type Two issue that becomes really rare and prohibitively expensive in higher grades. This deep russet color example is well-detailed for the issue and shows no detracting marks. As a date, the 1874-CC is definitely scarcer than the other two obtainable Type Two issues from this mint—the 1875-CC and the 1876-CC. What makes this date different, however, is its rarity profile in higher grades. The 1875-CC and the 1876-CC are common in AU grades and are even obtainable in the lower Mint State range. The 1874-CC is far rarer in AU55 and above, but this is not reflected in the price levels for lower grade examples. The 1876-CC is a very popular date with type collectors, as it is among the best-made Type Two CC Double Eagles, and it tends to show less extensive abrasions than the 1875-CC. It is also popular due to its Centennial year issuance. Doug Winter carefully selected this piece from a fresh group of coins from a European source, and it is uncommonly choice for the assigned grade. This date is numismatically significant as the final year of issue for the Type Two design. This example has great color and presents very well due to its overall originality. These coins are so rare, that our expert Doug Winter was able to find only TWO of these coins for ASI readers. CAC has approved 29 examples in this grade with 130 finer. For just a small premium, you can “step up” to an AU50 coin. At one time, the 1889-CC was regarded as a semi-key issue in the Type Three CC Double Eagle series, but hundreds have been located in Europe and repatriated. However, only a small percentage of these have the eye appeal of this coin. This piece has really nice surfaces with deep, natural color. 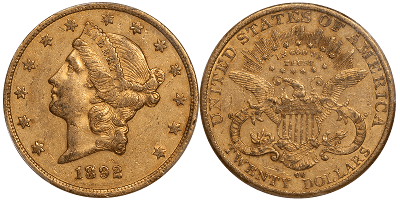 This Type Three issue is the second-to-last CC Double Eagle, and it is tougher to locate than generally acknowledged. This is as nice an EF45 as you are likely to see, with great natural color. CAC has approved 7 in this grade with 46 finer. Unlike bullion coins, which are minted on a regular basis, rare U.S. coins are extremely scarce and represent a unique moment in time. 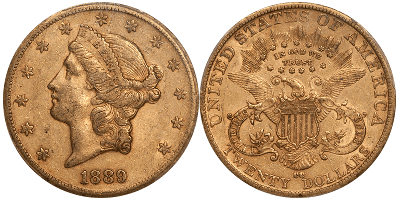 The Carson City Double Eagles are a prime example of coins that have been hidden from the world for decades. Because many CC Double Eagles ended up locked away in European banks, now is the time to get your hands on one of America’s quintessential Wild West coins before they become hidden from the public eye again. For more information about adding these American staples to your rare coin portfolio, call us at 800-831-0007 or email us. *Prices are subject to change based on market fluctuation and availability. Prices reflected are for wire transfer, check, or cash only. Offer expires September 1, 2017.